Me encanta cocinar. It’s one of my favorite creative stress release activities. It’s also important for me to share my cooking with family and friends. 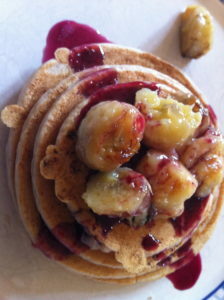 Dinner parties, family gatherings or just Sunday brunch is a common occurrence in my house. But I am not the best about cleaning up after myself. Dishes, pots and pans to sit in the sink for a little longer than they should. So our dishwasher and dishwashing soap have to be top notch to get out the stains, grease and mess we leave behind. 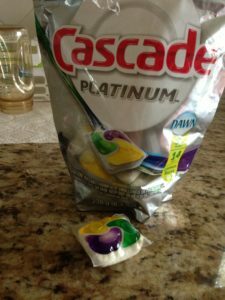 We’ve always used Cascade in our house and have had great results so I was excited to try out the Cascade Platinum products. Cascade Platinum offers triple action cleaning in a little pod. Platinum pacs remove stuck on food, eliminate the need to pre-wash and have a specially formulated design which removes hard-water film build. We’ve been testing out the pacs for the past month. Our dishes and dishwasher are sparkling clean at the end of the cycle and those tough stains have come right off. The pile of pots and pans next to the sink that need to be “re-cleaned” no longer exists. Try out Cascade Platinum in your home and let us know the results. Or join the Instagram contest and you could win a new Whirlpool dishwasher or a new Platinum kitchen makeover! Visit this web site (http://tinyurl.com/PlatBlog) for the details and be sure to tag your photos on Instagram with #MyPlatinum and @MyCascade. Also, be sure to “Like” Cascade on Facebook (http://on.fb.me/10Y8RQQ) to keep up to date on all of the new products and promotions. This entry was posted in Product Reviews and tagged Cascade, Dishes, product review. Bookmark the permalink. ← Are You Encouraging Summer reading for your tween?